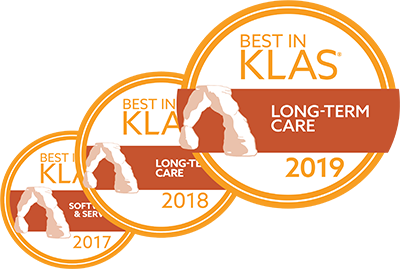 BLOOMINGTON, MN – MatrixCare®, the largest long-term post-acute care (LTPAC) technology provider in the United States, is pleased to be awarded the prestigious Best in KLAS Award for Long-Term Care Software for the second year in a row. The title of Best in KLAS is a highly valued acknowledgement of outstanding efforts by software and services organizations to help healthcare professionals deliver better care. It is reserved for technology solutions that provide the broadest operational and clinical impact on healthcare organizations, as determined by users of the technology. “While our competition continues to raise round after round of investment to fund operating losses or toils away with broken products and broken promises, MatrixCare continues to deliver exceptional outcomes for our customers. Our rock-solid operating performance and innovation-driven growth continues and we are very proud to once again receive the Best in KLAS award based solely upon the feedback of our customers.” said John Damgaard, MatrixCare CEO. This distinction comes on the heels of last fall’s Continuum of Care Report, wherein KLAS recognized MatrixCare as the top performing LTPAC EHR vendor, outpacing PointClickCare, CPSI (American HealthTech), and Netsmart (HealthMedX).